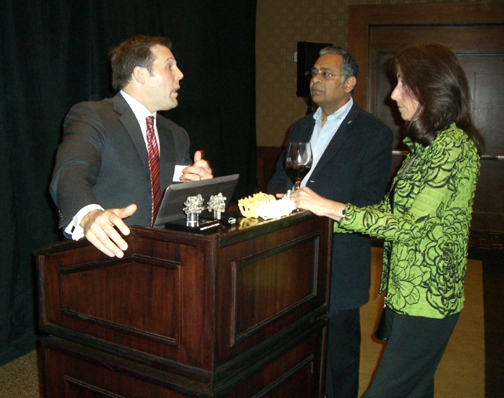 The Center for Spine Care’s Michael J. Musacchio, Jr., M.D., was the Program Chairman of an exciting Continuing Medical Education Symposium in which he presented to a packed room of colleagues at the Hotel Palomar, this past Tuesday night. John Peloza, M.D., Medical Director of the Center for Spine Care, and Nathan Walters, M.D., CSC’s Director of Pain Management, were also there. Hosted by the Texas Institute for Surgery (TIS) and the Center for Spine Care (CSC), Dr. Musacchio’s presentation focused on Minimally Invasive Approaches & Functional Preservation in Cervical Spine Surgery. As a true specialist in minimally-invasive surgery for the spine, Dr. Musacchio discussed with colleagues his experience in treating patients with spine pain and how minimally-invasive technologies benefit the patient’s outcome immensely. Using small incisions and small instrumentation, Dr. Musacchio and his colleague John Peloza, M.D. are able to achieve predictably successful outcomes for their patients. 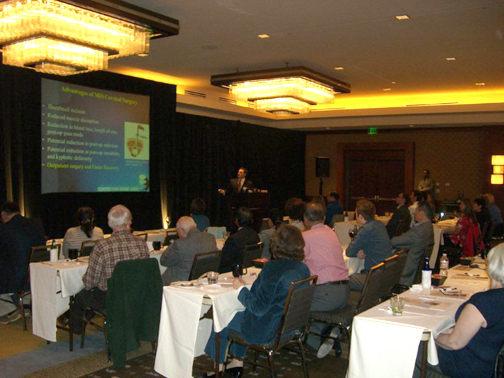 Several upcoming CME programs hosted by TIS & CSC are in the planning stages for 2011.